Travellers will have a different thing to worry about when they go on holiday when the paper aeroplane ticket virtually comes to an end tomorrow. World association the International Air Transport Association (IATA) currently are responsible for 240 carriers, which is 90 per cent of airline traffic, but they switch to an electronic ticketing system from tomorrow. The bulk of the tickets will now change to online bookings, saving the IATA's member airlines approximately £1.5 million, which will be very handy in the face of the rising fuel costs they are currently experiencing. Paper tickets issued before this date, but are for a holiday after this date, will still be valid. 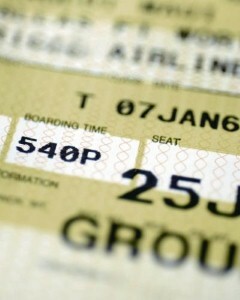 As well as saving money for airlines the IATA states that 50,000 trees will be saved by the end of the paper ticket. Holidaymakers have been warned by the travel insurance company esure that they should take out travel insurance in case their flight is cancelled or they lose their luggage when they go on holiday.